In the wake of the Second World War, the United States would become the leading proponent of free trade. But for nearly a century before, American foreign trade policy was dominated by extreme economic nationalism. What brought about this pronounced ideological, political, and economic about face? How did it affect Anglo-American imperialism? What were the repercussions for the global capitalist order? In answering these questions, my new book, The “Conspiracy” of Free Trade (Cambridge University Press, 2016), offers the first detailed account of the controversial Anglo-American struggle over empire and economic globalization in the mid to late 19th century. The book reinterprets Anglo-American imperialism through the global interplay between Victorian free trade cosmopolitanism and economic nationalism. It uncovers how imperial expansion and economic integration were mired in political and ideological conflict. Beginning in the 1840s, this conspiratorial struggle over political economy would rip apart the Republican Party, reshape the Democratic, and redirect Anglo-American imperial expansion for decades to come. Previous scholarship of Anglo-American imperialism, while prodigious, has focused primarily upon non-linear comparisons between the pre-1945 British Empire and the post-1945 American Empire. This book offers instead a contemporaneous study that bridges the historiographical divide separating mid- to late-19th-century American imperialism from histories of the British Empire and economic globalization. The book does so by focusing upon the ideological debates surrounding free trade and protectionism that came to dominate the era’s international political economic landscape, a global contest over capitalism and imperialism that was fought with special ferocity within the United States and throughout the British Empire. Where free trade held sway in Britain, in the United States, the Republican Party—the dominant party throughout most of this period—turned to economic nationalism. The party’s advocacy of the “American System” included high protective tariffs and subsidies for internal improvements. 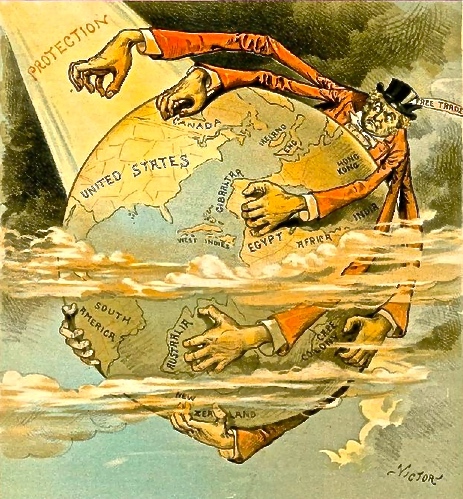 In other words, far from being an era of laissez faire and free markets as is commonly portrayed, the late 19th century was a time of substantial governmental interventionism in the American capitalist marketplace: with implications as well for US imperialism as Republicans increasingly sought coercive access to foreign markets. From the Civil War onward, the Republican Party thus set out to place the United States on a pronounced protectionist path for domestic economic growth and imperial expansion abroad. The prevalence of the ideology of economic nationalism in the United States during this period was palpable. So too was the prevalence of Anglophobia (fear or hatred of the British) and the belief that only protectionism could keep the United States safe from British free trade imperial designs. “Free Trade England Wants the Earth.” Pro-Republican Judge magazine depicts US protectionism shielding the country from the British free trade spider’s grasp, 27 Oct. 1888. American advocates of free trade were charged with being agents of the British, working in concert with Free Trade England in order to undermine the American protectionist system and destroy the country’s “infant” industries. American adherence to Victorian free trade ideology—the belief that international free trade and non-interventionism would bring prosperity and peace to the world—duly became anathema within protectionist Republican circles. As my study shows, despite intense Republican opposition, the influence of Victorian free trade ideas would reach their 19th-century apex during the non-consecutive Democratic administrations of Grover Cleveland (1885–89, 1893–97); subscribers to this new free trade ideology included Cleveland’s Secretaries of State, War, Agriculture, Interior, and Treasury. However, as a result, even seemingly mundane foreign policy disputes brought charges of a British free trade conspiracy against Cleveland’s cabinet. “Too Thin!” Judge magazine insinuates that John Bull, holding a free-trade bill behind his back, hides behind Cleveland’s transparent message of retaliation over the Canadian fisheries dispute. Judge, 15 Sept. 1888. 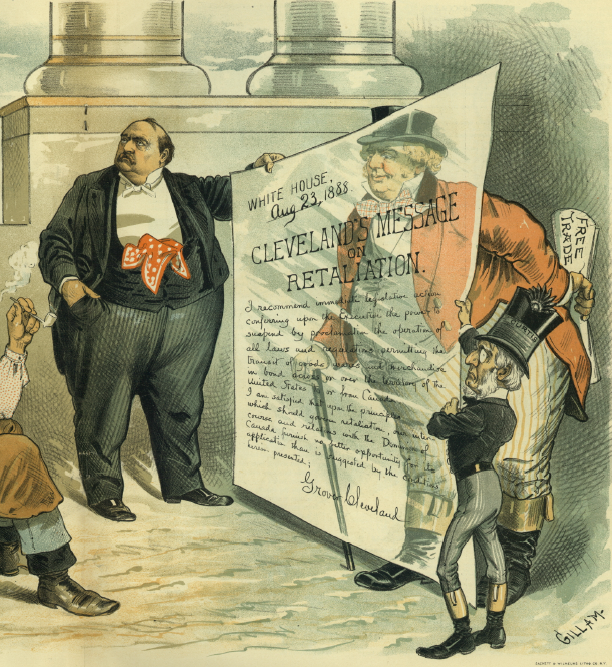 President Cleveland’s controversial December 1887 annual message calling for trade liberalization in turn forced the 1888 national elections into a referendum on the future of US economic globalization. According to the Republican opposition, it also showed Cleveland to be “an easy convert” to Victorian free trade ideology. The Republican National Committee noted that the president had “let the Democratic Free-Trade cat out of the Cleveland bag, and all the Free-Trade efforts in Great Britain and America cannot get it in again.” Republican charges that Cleveland and his cabinet were part of a vast free trade conspiracy trailed his re-election campaign. 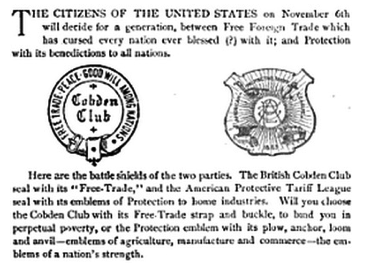 “Under which Emblem?” Above, the protectionist Tariff League Bulletin explains to its readers a month before the 1888 presidential elections that they must choose between the “battle shields of the two parties”—either the Democratic shield of the Cobden Club [left], which will “bind you in perpetual poverty,” or the Republican’s American Protective League [right], representing American manufactures, commerce, and agriculture alike. Tariff League Bulletin, 8 Oct. 1888. For Republican economic nationalists, American free trade advocacy became tantamount to conspiracy: a secretive British-led attempt to stunt the growth of U.S. “infant” industries and foil Republican imperial designs. The cosmopolitan ideology of free trade, in contestation with its economic nationalist counterpart, was thus interwoven within Anglo-American relations throughout the latter half of the 19th century, spindling alongside modern globalization’s interconnecting threads of global trade, communications, ideas, people, and policies. This conspiracy-laden late Victorian free trade-protectionist debate was a struggle over both US domestic prosperity and the course of economic globalization. It was an ideological battle that would reshape the late-19th-century U.S. political economy, and redirect Anglo-American imperial expansion for decades to come. The long-term effect of this political and ideological struggle over empire and economic globalization remains very much with us now. 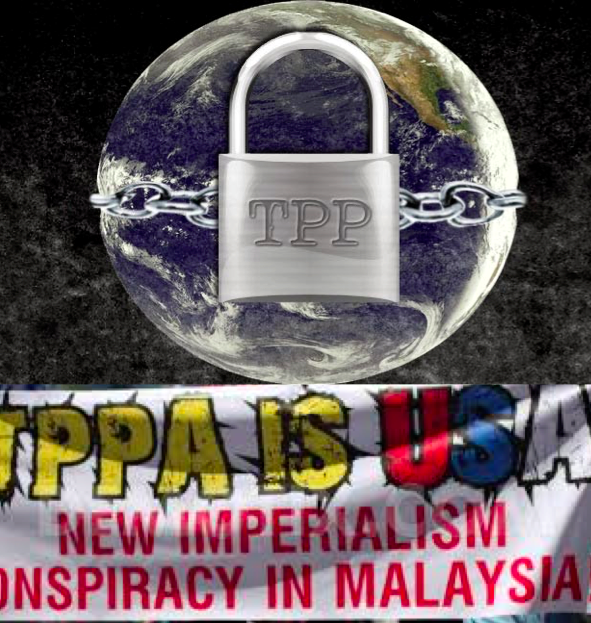 For example, much like in the late 19th century, free trade initiatives like the massive Trans-Pacific Partnership are increasingly coming under conspiratorial fire and are associated with US economic imperialism. The “Conspiracy” of Free Trade uncovers the remarkable story of how the United States went from becoming the lead opponent of free trade in the late 19th century to becoming free trade’s lead proponent today. It therefore also sheds much-needed historical light on 21st-century debates over the future course of economic globalization. You can read (for free) excerpts from the book’s Introduction and Chapter 1, “Globalizing Ideologies.” The book is available for purchase here.